Please use the following links to Barger-Mattson and other recycling industry resources that may help in your auto parts purchase. For addition resources or assistance please contact one of our parts sales representatives. Barger-Mattson is a full service auto salvage yard and used auto parts recycler. 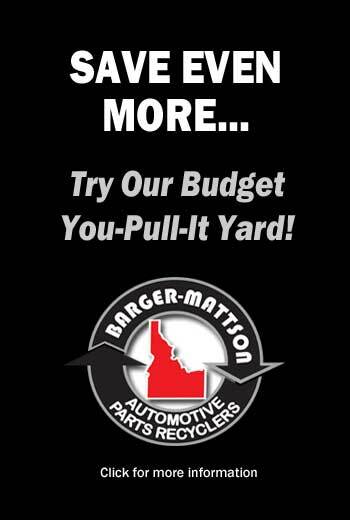 Offering some of the best prices on used auto parts in Idaho and the US, Barger-Mattson spans over 30 acres and is the largest used auto parts recycler in Idaho. BM offers thousands of in-stock parts for your car, truck, van and SUV including: engines, transmissions, rear ends, axles, transfer cases, suspension parts, wheels and tires as well as used auto body parts such as: bumpers, doors, hoods, grilles, fenders, doors, deck lids, complete front ends, quarter and rear body panels, lamps, headlights, taillights and glasses. We offer interior parts including; seats, radios, CD players, air bags, air bag modules and more. Other BM services include; budget pull your own auto parts yard, new aftermarket parts sales, local wrecked, salvage, junk and unwanted car buying as well as nationwide parts locating service, nationwide shipping and more. Barger-Mattson serves local cities and geographical areas including: Idaho, Twin Falls, Boise, Pocatello, Jerome, Burley, Rupert, Hailey, Mountain Home, Chubbuck, Blackfoot, Garden City, Kuna, Meridian, Eagle, Nampa, Utah, Ogden, Salt Lake City, Nevada, Oregon, Wyoming, Montana and entire US via nationwide shipping. Used Auto Parts Prices & Locating Services in Idaho.